Well here is another syndrome to add to the list. “New pond syndrome”, and all of us pond keepers go through it at some point. 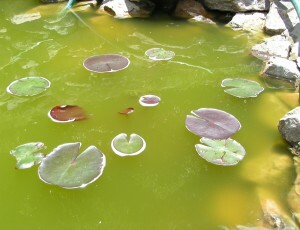 New pond syndrome can be very stressful for some new pond owners. We have our beautiful new pond and then wham, the pond goes completely green and out of balance. What’s different about this syndrome is that the pond is the issue and the cure. The pond that is causing stress, will be the same pond that relieves stress. There is no little yellow pill necessary, a yellow water lily bloom will do the trick. When I build ponds and water features for customers there is a very specific process that is gone through. The process begins with the initial meeting with the customer and continues until the final pond orientation talk with the customer, when the pond installation is completed. One step of this process is done before final payment is made, it is what is called the “pond orientation”. This is the point in the process where construction is complete and the job site has been cleaned up for final presentation to the customer. During final presentation the pond orientation is performed with the customer. The pond orientation itself is also a very specific process. During the orientation the customer is informed on general fish care, aquatic plant care, and how to maintain their pond. The customer is introduced to all of their new equipment, and made aware of where everything is located and how it all functions; and presented with the equipment warranties. 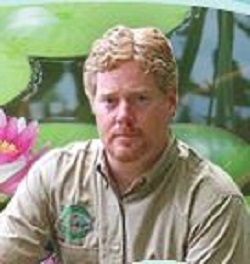 Its important stuff for the customer to know about their pond, and it is good customer service as well. The pond orientation is basically a scripted punch list of information that the customer should know about their new pond or water feature. Probably one of the most important points that is made with the customer during pond orientation is a segment called “what to expect in the 40 days of your new water feature”. This also seems to be one of the most ignored bits of information that the customer receives during the orientation as well! Customers want their ponds to stay in that “day 1” condition when the pond is more of a water feature than a pond, with it’s gin clear water, debris free interior, and not a speck of algae to be seen. By “day 40” it has typically turned into a real pond after aquatic plants and fish have been introduced. “Day 40” will usually be clear water, but not gin clear anymore, some algae growth on the rocks would be normal, and there may be a leaf or two that did not make it into your skimming system. During that 40ish day adventure into pond keeping, new pond owners need to be prepared for the appearance of green water conditions. Green water is what typically makes new pond owners very anxious and they may start reaching for chemicals and treatments to pour into their pond when really patience is the remedy. During pond orientation customers are always advised to expect some hazy green water quality about 2-3 weeks after a pond is started, and then again at about 6 weeks or so. The customer is made aware that green water in a pond is a very normal and temporary condition that occurs, and is affectionately known as “new pond syndrome”. The green water condition will usually last about 2 weeks and will clear faster with a bit of beneficial bacteria, as opposed to dosing their new ponds with algaecides. The customer is also made aware that green water is rarely uncomfortable or dangerous for their fish, they need no special treatment during this time, and feedings should continue as usual. The pond orientation is a great way to be sure that the customer is prepared for what to expect after becoming a new pond owner. It also prepares them for “new pond syndrome” which makes new pond owners nervous, so remind them that the little yellow flower is just the remedy. New pond owners have a lot to take in and learn and with an orientation form a pond pro, they’ll have a great start. I have a green pond that doesn’t have any fishes yet. It was muddy when installed and now cleaned out. Water was refilled in the pond yet the pond continues to be green.i haven’t even introduced any fishes into the pond yet. It’s been2weeks now and it is even worse by adding beneficial bacteria. It looks like a hot swampy pond now. Any suggestions? Hi Mike. I recently upgraded my pond from 200/gal to 700/gal and Now I have a green pond. I have a new filter that has a little uv light and I was wonder if I need to get an external UVC light to help with the green water? Do I need to add more air? I have the laguna clear- flo 2000 UVC filter, is this adequate for 700/gal pond? After digging my pond 185×85 do I need to treat the soil with anything before filling . what to do about string algae…tried everything…always comes back. If I do nothing it well surely take over! !